Sea Fortress Suomenlinna and Ullanlinna are good opportunities to explore the local culture. Visit Rock Church and Helsinki Cathedral for their historical value. 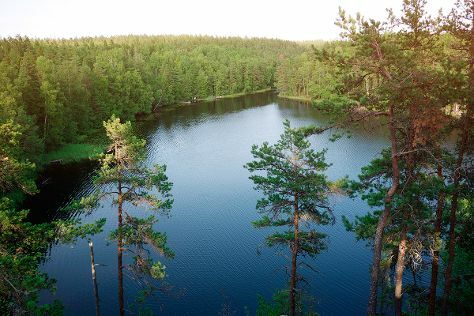 Get out of town with these interesting Helsinki side-trips: Nuuksio National Park (in Espoo), Sipoonkorven Kansallispuisto (in Vantaa) and Teijo national park (in Pernio). Next up on the itinerary: take a stroll through Katajanokka, hunt for treasures at Old Market Hall, tour the pleasant surroundings at Pornaistenniemi Nature Trail, and make a trip to The Esplanadi Park. For photos, traveler tips, where to stay, and other tourist information, use the Helsinki trip itinerary planning app . If you are flying in from United States, the closest major airport is Helsinki Vantaa Airport. In April in Helsinki, expect temperatures between 47°F during the day and 32°F at night. Finish your sightseeing early on the 30th (Tue) so you can travel back home.